I have long been convinced that all the gifts listed by Paul in Ephesians 4:11 are of vital importance to the health of the church. However, having spent my formative years in a cessationist/conservative evangelical church, I have often felt a certain defensiveness when broaching the subject of modern-day apostles and prophets with those who hail from this background. The conservative evangelicals I know are convinced that it’s clear and obvious that these were special gifts, limited to the first century of the church. In this view, the apostles and prophets were essentially walking, talking Bibles; authoritative sources of revelation that the church could trust. They were given to the church to ensure the Bible was completed with the New Testament witness to Jesus. Since we now have the Bible, we have no need of these more extraordinary gifts and are left with pastors and teachers whose job it is to explain the Bible for the instruction of the church. Where Roman Catholics claim ongoing apostolic validity via apostolic succession traced down the centuries, conservative evangelicals claim apostolicity through their reliance on the Scriptures. Combined with their reputation as people of the Word, the conservative evangelical certainty on this matter is formidable. They give the impression that the burden of proof lies with whackos like me who suggest that Jesus may still be giving apostles and prophets to the church today, rather than upon themselves who claim God intended a radical ecclesial shift to occur with the passing of the original apostles. 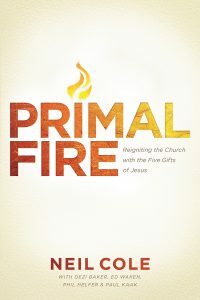 Opposition to the prophetic and apostolic gifts is nothing new. Jesus spoke against the religious leaders of His day who honored the very prophets their ancestors had persecuted and killed. Woe to you! For you build the tombs of the prophets, and it was your fathers who killed them. . . . For this reason also the wisdom of God said, “I will send to them prophets and apostles, and some of them they will kill and some they will persecute. Today there is no less resistance to the apostolic and prophetic gifts by the religious establishment. But instead of making martyrs of the apostles and prophets and having to raise statues in their name, the religious leaders of our day have found it far easier to theologically define these gifts out of existence. Instead of killing them in public, they have expunged them from their theological textbooks, classrooms, boardrooms, and pulpits. They remove them before they can even become a problem. This is another way of killing them, without having to look like murderers. They simply deny their existence and do not allow any place for them. This they do with their Bibles open, but without a shred of biblical support. A good quote and one that is thought provoking and puts the widespread denial – or just plain indifference – of Ephesians 4 gifts into context.